The transition to the 4th republic in May 29, 1999 ushered in democracy and with it a new constitution, under which the current National Gender policy was promulgated. This policy recommends that women be represented by at least 35% in both elected and appointed public service positions. One of such key offices is the National Assembly. In the last 5 National Assembly terms, women have remained consistently underrepresented. 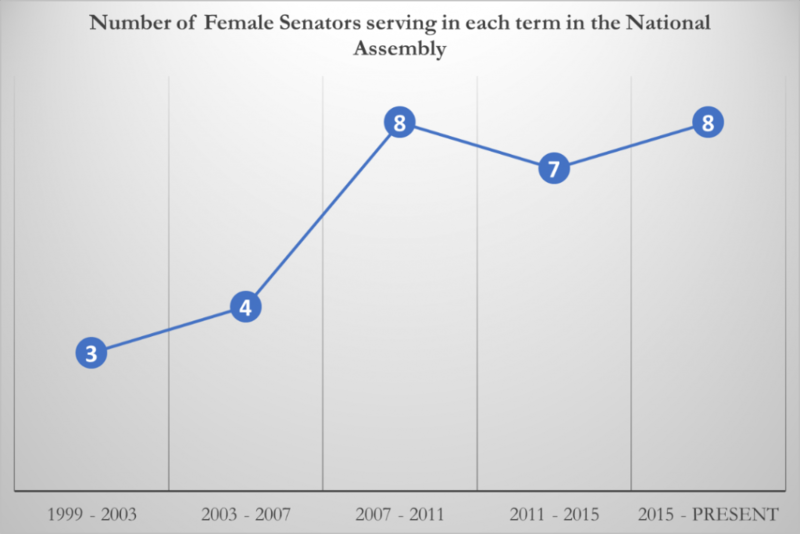 The chart below shows the number of female senators in the 109 available seats since 1999 in the Nigerian Senate. While only 18 out of 36 States (50%) have previously had female senators, some states have had more female senators than others and some regions appear to be more pliant to having female senators than others. 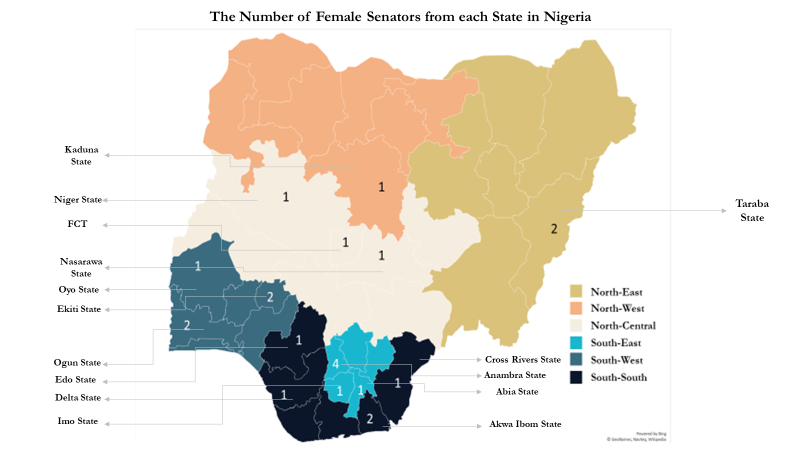 The South-East and South-West have had the most female Senators (6 each), with Anambra (in the South-East) being the state with the most female Senators (4) over the last 5 terms. The South-South has had 5 female Senators over the last 5 terms. The North-Central has had 4 female Senators over the last 5 terms. The North-East has had 3 female Senators over the last 5 terms. 21 female senators were elected on the People’s Democratic Party (PDP). When the PDP was the ruling Party at the National Level (1999 – 2015), 18 female senators were elected from the party, which translates to an average of 4.5 women per term. Since APC has been the ruling party at the National level in 2015, 3 women senators have been elected. To meet the ideal benchmark for the National Gender Policy i.e 38 women, the major parties, i.e ruling & opposition must collectively present 34 women in each term of the National Assembly. A term is 4 years. 48% of female Senators had served in a previous administration in an appointed capacity. 44% of female Senators have a blood relation with a Nigerian Politician. 24% of female Senators had previously been members of the House of Representatives. 32% of female Senators have served multiple terms. 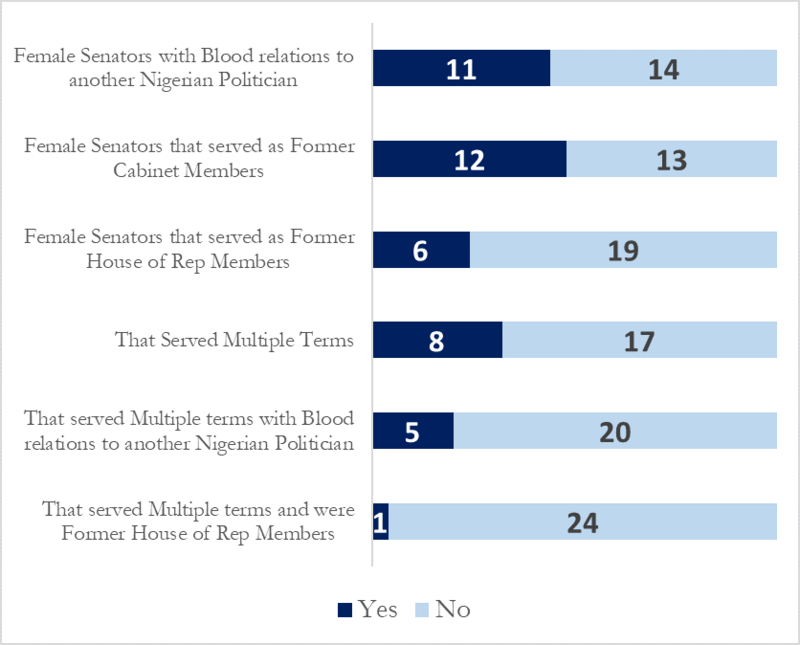 Over 60% of Female Senators who have served multiple terms have Blood Relations with another Nigerian Politician, i.e. are/were married to another Politician or is a child of a politician or a sibling of another politician. In 2017, 15 female world leaders were currently serving in office, eight of whom were members of the prime leadership for their country. (Geiger, 2017). Globally, the world is becoming more accepting of female leadership, according to Pew research, the number of current female leaders (excluding monarchs and figurehead leaders) has doubled since 2000. As the 2019 election cycle in Nigeria approaches, it brings with it an opportunity for the emergence of new female players across party lines that may in turn push the Nigerian government further towards achieving the target National Gender Policy quota, thus reducing the shortfall of female players at such high level of offices.